When it's time to enhance your property Levanduski Landscapes Inc. can design and build esthetic as well as functional improvements that the residents, workers, or visitors will appreciate. Our landscape designers will create a new landscape or renovation plan or we will work with your architect's plans for new construction or additions. 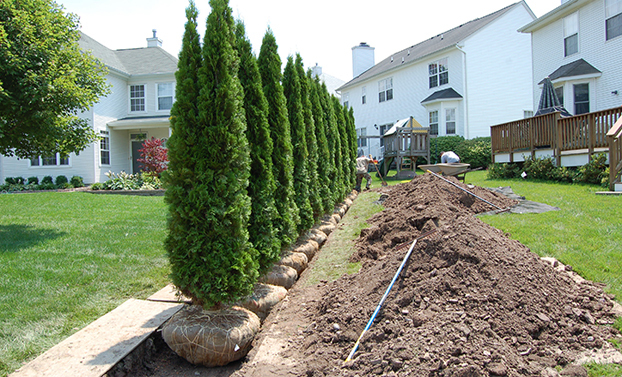 Whether it's a large scale landscape project involving large caliper trees, or hardscape, turf and shrubs, every Levanduski Landscapes client receives the attention to detail that has made us one of the regions largest, independently owned grounds maintenance services. Are drainage improvements needed at your property, condominium or townhouse community, corporate campus or industrial park? We design and install a carefully thought out, environmental, and code-meeting solution to cure even the thorniest drainage problem. A new sidewalk design, perhaps hardscaping may be needed, either could be a design option a client wishes to add along with a drainage project. We've designed and built such enhancements for years. We will work with you, and your architects if you desire, to present a concept that is true to the environment and the planned new look of your property. Trees and shrubs, even ones given the famous Levanduski Landscapes professional attention, may need to be replaced. Or, you may decide that it's time to upgrade the greenery on your own. Rely on our knowledge of indigenous species as well as those from outside our area with the greatest chance to flourish. We help our clients to enhance as well as maintain their grounds.